Ann Schwader, who had served as an SDSU Extension nutrition field specialist, has taken a new job as program assessment and reporting coordinator with SDSU Extension. Schwader started in her position on June 22 and will be able to continue to work at the Winner Regional Center. 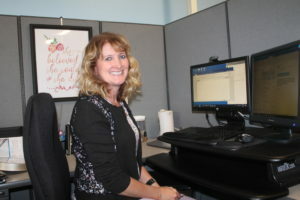 As the program assessment and reporting coordinator, she plans, facilitates and delivers evaluation training, education and technical assistance to faculty, field specialists, 4-H advisors and other staff throughout the SDSU extension system. She is also responsible for writing print versions of guides and training materials. “I’ll be providing leadership to technical writing for program business plans, programmatic impact statements and some section areas of grant applications,” Schwader said. In addition, she is responsible for the preparation of the federal annual report and the federal Plan of Work for the National Institute of Food and Agriculture. She works with the North Central Cooperative Extension Association with the purpose of collecting and reporting data to the USDA. This year she had the opportunity to help prepare the federal report, which is a very comprehensive annual report that covers all of SDSU Extension. “I’ll be providing leadership to the technical management of the SDSU Extension data system which collects reporting accountability data. I’ll strive to make the reporting system as user-friendly as possible, while at the same time meeting the needs of extension,” she said. Schwader, who has spent 28 years in extension work, is excited about her new job. “I love to learn and I love challenges,” she added. For over 6 years, Schwader served as the nutrition field specialist at the Extension center in Winner. She started in October 2011 with the reorganization of the Extension service. The reorganization put eight regional centers in strategic locations in the state with Winner being one of those centers. The Winner Regional Extension Center is located in the Winner City Hall building. As a nutrition field specialist her efforts were focused on using innovative strategies to promote healthy nutrition and physical activity statewide to help prevent and manage chronic diseases. Prior to working in Winner, Schwader was the Gregory County family and consumer sciences Extension educator. She held this position in Burke for over nine years. For 11 years, Schwader worked as a family and consumer sciences Extension agent in Elizabethtown, NC. While working full time she was allowed time to receive her master’s degree from North Carolina State University. She has a Master’s of Education in adult education with special emphasis in extension sciences. Raised in Spencer, Neb., her undergraduate degree is from the University of Nebraska at Lincoln.